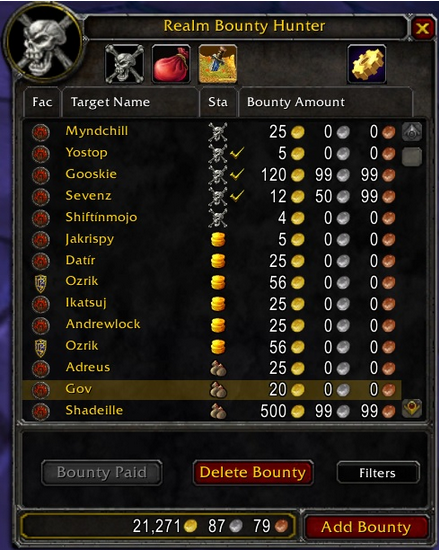 Realm Bounty Hunter is a PvP addon that allows players to place gold bounties on other player characters. Bounty lists are shared with other RBH users on the realm via a public channel, a private channel, or a guild channel. Left click the mini-map skull button to open the bounty list UI. This will display a list of all bounties made by players in the same registered channels as you. Each row is a bounty. The columns list the bounty's faction, target name, status and amount. The status is indicated by one of three icons: gold coins, skull and crossbones or bags. The gold coins means the bounty is open and can be claimed by the the first person to kill the bounty target. The skull means the bounty has been claimed. 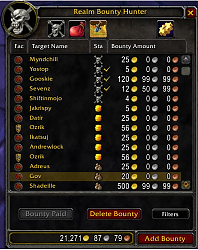 To see who claimed it, hover the mouse over the bounty and it will tell you in the tooltip. The tooltip also tells you who issued the bounty. The bags icon indicates the bounty has been paid. Once the bounty claimer has been paid by the issuer, only the claimer can set the bounty to paid by pressing the Bounty Paid button. The gold on the bottom of the panel is your Realm Bounty Hunter balance. This represents the amount of gold available to you for placing bounties. It is equal to your current gold minus the value of all unpaid bounties you have issued. Right click the mini-map button to place a bounty or click the Add Bounties button on the bounty list UI. When placing a bounty it is best to have the bounty target selected as your target. This will populate the bounty list with intel data about the target such as faction, location, time last seen, and more importantly it will allow for more secure verification of bounty claims. Bounty lists should sync automatically with all those registered to the same channels as you. Killing bounty targets will automatically mark the bounty as claimed by you. Click the Delete Bounty button to delete the selected bounty. You may only delete bounties that YOU have placed. Once you have collected payment for a bounty you claimed from the issuer of the bounty, mark the bounty as paid by clicking the Bounty Paid button. Bounties may only be marked as paid by the claimer of the bounty. If you placed a bounty on a player while targeting that player, the bounty will have an additional method of authenticating claimed bounties. This will place a lock icon next to the bounty status icon. When the claimer is online at the same time as you, the addons will exchange some data and the lock will change to a gold check mark. If you placed the bounty while targeting the enemy player and you do not see the check mark next to the skull, the bounty claimer may be up to shenanigans. Unfortunately until Blizzard allows us to collect heads or some token from player kills, there will be no 100% guarantee that the bounty was claimed by killing the target player with no shenanigans. However, it is the goal of this addon to provide as much proof of a kill as reasonably possible. In the future I plan to capture sections of the combat log for the bounty issuer to inspect before paying the claimer. Maybe even capturing screenshots and sending them out on twitter or something. In the mean time, treat all bounty claims with skepticism and try to place all your bounties while targeting the player in order to take advantage of the verification system in place. Trophy Bag: When a player kills another player character from the bounty list, the head of the killed character will be placed in a custom Trophy Bag created by the addon. Bounties can be claimed by meeting up with the issuer of the bounty and trading the head for gold. Gather Intel: There will also be an intel gathering system which allows players to collect info on bounty targets. This requires logging in with a "spy" character of the opposite faction. Fixed a bug with the comms channels. Made some cosmetic changes to the UI. Yeah I know what you mean. I've got a few ideas for that.